The amount of money fraudulently spent using contactless payment cards and mobile devices has increased by £4.2m as their usage across the population has become more widespread. Almost £7m was taken in 2016, compared to £2.8m in 2015, according to Financial Fraud Action UK. 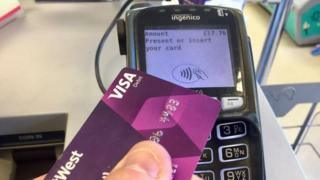 In the same period, contactless spending rose from £7.75bn to £25.2bn. The figures translate as a loss of 2.7p for every £100 spent, which is actually a fall from 3.6p in every £100 spent in 2015. A judge recently slammed the technology, which does not require a PIN, for making life "too easy" for criminals during the sentencing of a fraudster in Devon. Contactless cards can be used for transactions of up to £30. Gareth Shaw, money expert with consumer group Which?, said there are "still questions around the security of these cards". "Card companies must be responsible for striking a better balance between convenience and security," he said. Image caption Bethan Davies lost her card on a night out and it was used for contactless payments for the next two weeks. Bethan Davies, 37, works for a communications agency and had around £200 stolen from her contactless card after losing it on a night out in central London last summer. She cancelled the HSBC card the following morning, but noticed further activity over the next two weeks. She said: "I'm quite fastidious at checking my statement and I saw loads of small transactions coming out, from places like Tesco, food and wine shops and weirdly a dog grooming parlour in North London. "Because the transactions were small, from a couple of quid up to £12, they went under the radar and were still being authorised." She said money was refunded straight away. An HSBC spokesperson said: "We cannot go into any detail of how our fraud systems work but customers are protected against losses from this type of fraud." Student Hatty Sharp, 22, had her card stolen while shopping at an Aldi in Southampton. She said: "I immediately cancelled my Santander card, and then phoned up to cancel my HSBC card, but was put on hold for 15 minutes. In this time the thief had gone to the off-licence around the corner and spent £17, I presume on alcohol." She reported the crime to the police, and was fully refunded within two weeks. Never hand over a card If your card is taken out of your sight someone could ‘skim it’, copying the data from its magnetic strip. Ask for a receipt Contactless users aren’t always offered a receipt, so if you want to keep track of spending or make sure a transaction is genuine, you should ask for one. Check your statements Regularly look for unusual transactions, including on lost or stolen cards, as in some cases they can still be used after being cancelled. Digital wallets You can store your card details in a ‘digital wallet’ in the apps, Apple Pay and Android Pay. These allow you to buy goods by holding your phone over a contactless reader. Andrew Bailey, chief executive of the Financial Conduct Authority said: "The overall risk is low" but added "we have been urgently working with card schemes and banks to ensure this issue is fixed." Contactless card fraud accounts for 1.1% of total card fraud. In a letter to the Treasury Select Committee earlier this year, John Griffith-Jones, Chair of the Financial Conduct Authority said "public confidence could be eroded without further action". Richard Koch, Head of Policy at The UK Cards Association, which represents card issuers, said: "All contactless cards contain robust security features including an in-built security check which triggers the need to enter a PIN at certain points. "Customers are fully protected against any losses and will never be left out of pocket in the unlikely event they are the victim of this type of fraud, unlike if they lose cash." 2007 First contactless cards issued in the UK, with a £10 limit. 2012 Transport for London (TFL) began accepting payments for buses, extending to Tube and rail in 2014. 2015 Limit increased from £20 per transaction, to £30. 2017 In the week ending 29 April, TFL had a record week with 13.7 million contactless journeys. Did you know... the number of consecutive, contactless transactions before a PIN is required is limited, and not made public to avoid tipping off fraudsters. Update 13 July 2017: This article has been updated to put the increased fraud into greater context given the overall growth in contactless spending. Will paying with contactless cards make us less healthy?